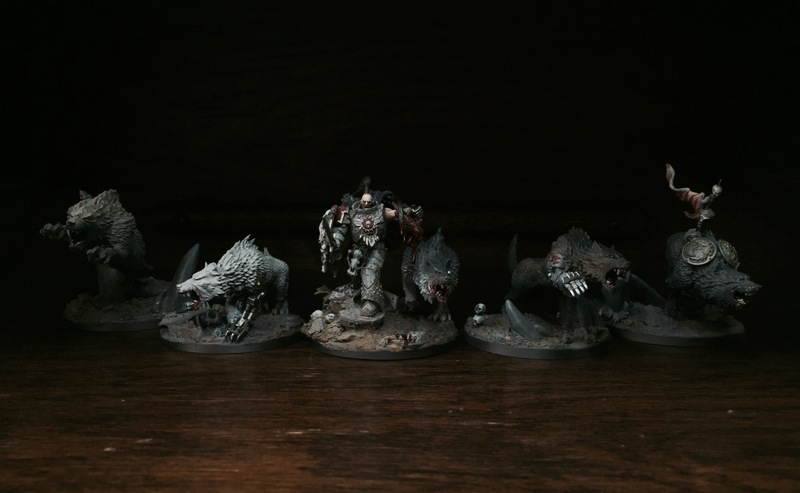 The (thunder) Wolves are done – and eventually deserve a proper photoshoot, perhaps a full army shot, and on the newly finished terrain even. Right now, it’s head down and finishing this Vlka build with a cohort of Iron Priestly brothers loaded for elephant (or Wraihtlords). My count as Centurions with a Master of the Forge to lead them. The different Kaerls will be count as scouts from the Sentinels of Terra detachment where these also belong, while the main body of the army uses the Company of the Great Wolf book. 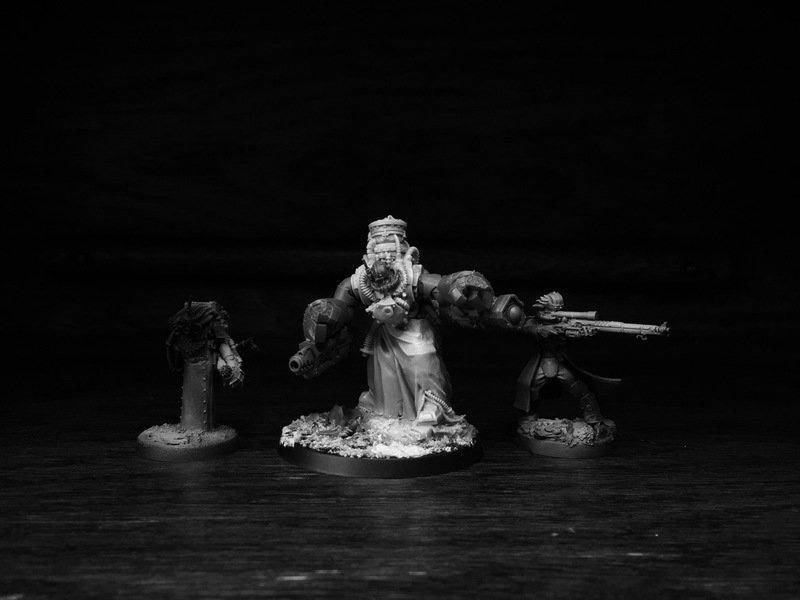 The “Centurions” will get a thoughtful sprinkle of space wolf and adeptus mechanicus plastic parts for detailing and be painted much darker than the rest of the Wolves – a step towards the Kaerls. I must admit it feels quite thrilling getting so close to a full 2000pts army painted and converted to a standard I’m pleased with. I didn’t know if it was possible after the Legion project. If I could ever take on something with similar ambition, with so many new techniques and pull it off in a reasonable time and consistency from the start to finish. Amazing miniatures as usual, Migsula. I love how beefy and brutal those fists make the Myrmidons look. Rock ’em, Sock ’em Mechanicus! As a rookie INQ28 hobbyist your work is both inspiring and deflating. I stare at my bits box for hours — inspiration it seems is not ‘free’. Curating a vision from concept to completion is a process and you make it look all too easy. Very cool. Those myrmidons look absolutely badass! The powerfist/underslung heavy weapon combo is perhaps still a bit over the top for my taste, but it works much better on these models than on the centurions. Reaching 2000 pts in half a year with such a heavily converted army is extremely impressive! Hats off to you sir. Thanks Mate. I hear you. I think adding a layer of detail: servo skulls, pelts, totems, devices will balance the massive arms a little bit. Quite a feat! The Wolves look great, much better without the riders (I’ll never get tired of complaining about those riders). Will you include the smaller Fenrisian wolves too somehow? I think their sculpts are even better. Whilst I’m not a huge fan of the Myrmidons, nor any Mark Bedford sculpt for that matter, I think you’ve done something wonderful with them. The centurion arms look brutal. Building an army and keeping oneself within the restrictions that that entails is a great way to spur creativity I think. Imagination needs some sort of resistance/constraint. Thanks! Agreed on constraints. The ally system still allows so much count as goodness, but having a framework is very important. Great progress, and go for the 2000! 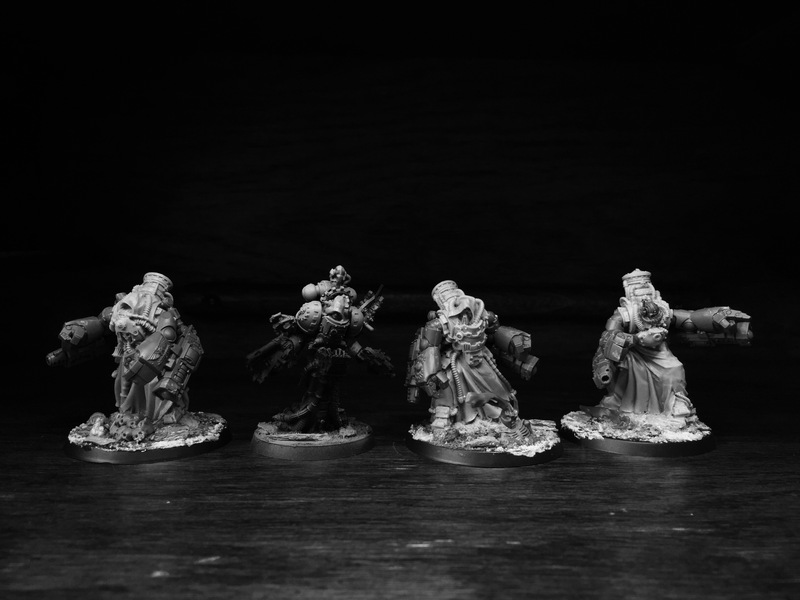 Definitely not a stereotypical SW army, ggreat individualistic touch with the Centurions and Kaerls… I like that.